Phil Mickelson has won three major championships and reached a career high world ranking of 2nd in multiple years. He is nicknamed "Lefty" for his left-handed swing, even though he is otherwise right-handed. Fred Couples is a former World No. 1, he has won numerous events, most notably the Masters Tournament in 1992. 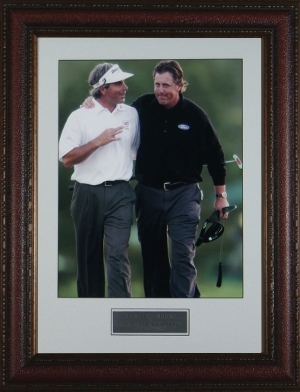 This is a 16x20 unsigned 2006 Masters photo of Phil Mickelson and Fred Couples. Custom Leather Framed and Matted.